Chengdu, capital of the Sichuan province and home to over 10 million people, offers visitors a wealth of things to do. From visiting big, cuddly panda bears to watching fire-breathing performers at the Sichuan Opera, and wandering the grounds of ancient monasteries and temples, there's something for everyone. While I flew to Chengdu from Shenzhen, near the coast, on my own, it's also possible to book China tours from Hong Kong if you'd like extra support. 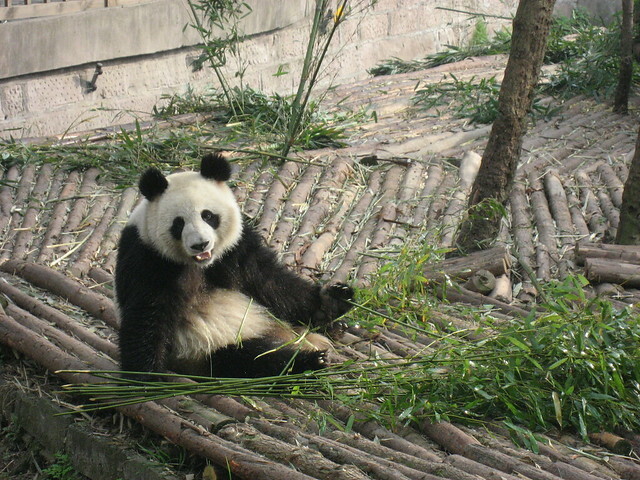 Below are my top five things to do in Chengdu, based on my two weeks in the city. The #1 ranked activity on TripAdvisor, and a perennial favorite amongst all travelers to Chengdu, is a visit to the Giant Panda Research Base. Founded in 1987 with a mere six giant pandas rescued from the wild, the successful breeding program produced 124 panda births within the first 20 years, and it's still going strong. The Research Base is open all year, from 8am to 6pm daily. The best time to visit is in the morning, between 8:30am to 10am when the pandas are being fed. This is when they're most active. You'll be able to see adults, adolescents, and cute little panda cubs too. My friend Charlie, with whom I stayed in Chengdu, insisted I go to the Sichuan Opera. On my last night in the city, I attended a performance, and was blown away. It's not an opera in the traditional sense, but a variety show which exposes those in the audience to a series of performances, from the musical and acrobatic, to comedy and a climactic fire-breathing finale. Du Fu was an ancient Chinese poet who moved to Chengdu in the mid-8th Century to escape the An-Shi Rebellion. He set up a thatched cottage, and proceeded to produce over 240 poems during the following four years. Today, the cottage and associated museum stands as a testament to his spirit, and his contributions toward Chinese literature. My experience walking around the grounds on my own was a pleasant and relaxing one. The grounds are beautifully manicured, and the pathways are filled with bonsai trees. The Jinli Pedestrian Street is lined with tea shops, souvenir stalls, and places to fill your belly with traditional Sichuan foods. On my visit one early evening, I stopped at a restaurant to sample two exotic dishes: pig's tail served with a spicy ground pepper, and chicken gizzards. I was a fan of the first, but not the second. 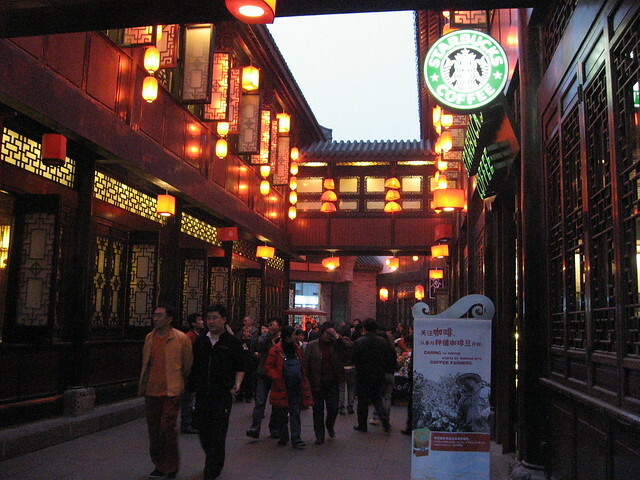 Despite the design attempts to make the street look like an ancient alleyway, there was no escaping the glow of a green and white Starbucks coffee sign. The People's Park is a massive urban park where locals go about their daily life. For foreign visitors, it offers a fascinating glimpse into a different way of life. Large groups of locals can be seen doing group aerobics classes. Performers sing and dance to large crowds. And then there's the beauty of the gardens and flowers. I arrived at the start of Spring, as cherry blossoms and other flowers were slowly starting to bloom, and bring bright natural colors back to the park. I also found a tea stall on the edge of a pond, and treated myself to a green tea with flower blossoms in it. Served along with a giant thermus of hot water, it felt like I had all the time in the world to sit back, relax, and observe everyone around me. These were my favorite experiences, but there was much more to my visit. China has so much to offer, and I realize my two weeks in Chengdu was the tip of a monumental iceberg. For those unsure about visiting on their own, consider China tour packages to get you the support you need to make your own visit a reality. This post was written by Dave, and brought to you by China Tours Tailor. Looks like some interesting things to do. I think that I’d like the people’s park. Eating late night “hot pot” sounds pretty cool as well.